The number of homeless 18-24 year olds has shot up in the last three years. 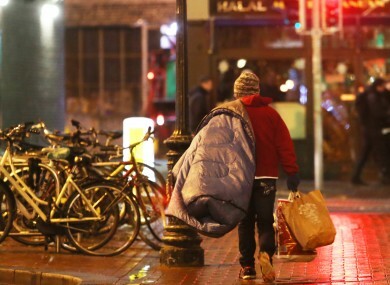 THE NUMBER OF homeless 18-24 year-olds has shot up by 78% in the last three years according to the latest figures. The Department of Housing has reported 776 young people were homeless and in emergency accommodation in the week of 20-26 February this year. Back in April 2014 this figure was 436. Focus Ireland’s Easter appeal focuses on the story of a 19-year-old woman called Paula who recently experienced a period of sleeping on the streets and in emergency accomodation. At 18, she exited the care system and said she felt “so alone and afraid”. I packed my things and moved to a bedsit I’d found, but I only ended up lasting one night. It was filthy, damp, mouldy, and crawling with insects. The neighbours were scary. I left. And that is when I become homeless. She got in touch with Focus Ireland and a temporary place was found for the young woman. They are now working towards getting her a flat of her own to move into. I can’t tell you how amazing it is not to be on the streets anymore. I don’t have to kill time on a dark corner until a shelter will let me in for the night. I don’t have to share a room with strangers who are a lot older than me. I honestly feel like that’s all behind me now. So one day soon I’m going to close my own door, lock it behind me and feel safe. I’m going to put the kettle on, sit down, relax and start planning my next move – looking for a job, doing a course and starting my new life. Young people in this age bracket now make up 10% of the recorded number of 7, 421 people who are currently homeless in Ireland. Focus Ireland’s Director of Advocacy Mike Allen said these young people have been “hit hard” by the reduced rate of social welfare available to them. “When a young person falls into the nightmare that is homelessness, there’s always an underlying reason. Not getting accommodation or support upon leaving State care, family problems, mental health challenges and/or purely economic pressures and unemployment,” he said. It is wrong that young people are often left to fend for themselves in these situations. Focus Ireland – and others – are providing many vital services in co-operation with the State and local authorities but a lot more needs to be done as these young people are in danger of becoming the forgotten homeless if we don’t have more action. The charity’s service ‘Housing First for Youth’ provides young people like Paula with housing as quickly as possible and then intensive person-centres supports like healthcare, counselling, education, training and financial advice. “Our Housing First for Youth pilot scheme in Limerick has seen huge success – we’ve already set up 40 young people in secure homes,” Allen said. Email “'I felt so alone and afraid': Out of the care system and straight into homelessness”. Feedback on “'I felt so alone and afraid': Out of the care system and straight into homelessness”.